Easy Apple Cheesecake Bars are delicious fall dessert with crescent rolls, cream cheese, fresh apples and buttery cinnamon sugar topping. Save leftovers for breakfast! It’s perfect idea for make ahead, grab and go breakfast on busy mornings. Preparing these bars is similar in easiness as preparing this Custard Cake but more suited for mornings. 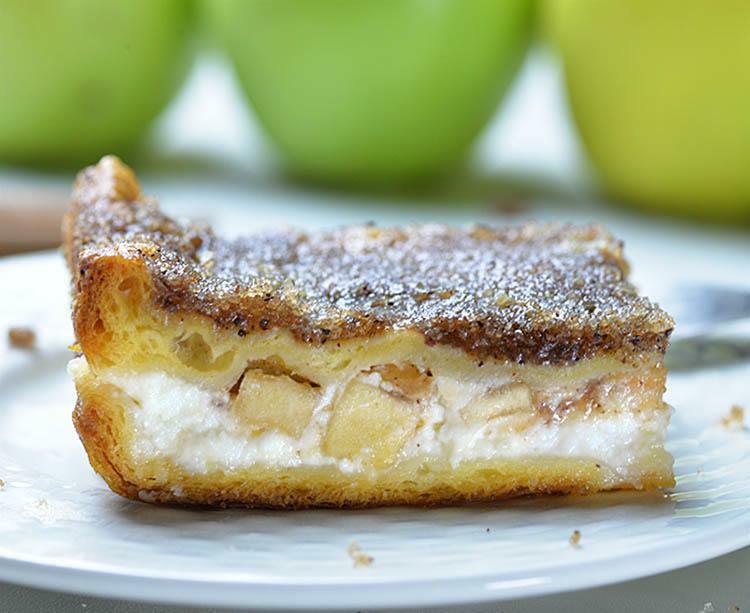 To tell the truth, these simple and quick recipe for Easy Apple Cheesecake Bars was inspired by my favorite pastry-Apple Cream Cheese Danish. But this time I left out the glaze and topped these bars with a lot of melted butter and cinnamon sugar mixture to create a sweet, crispy and buttery crust. 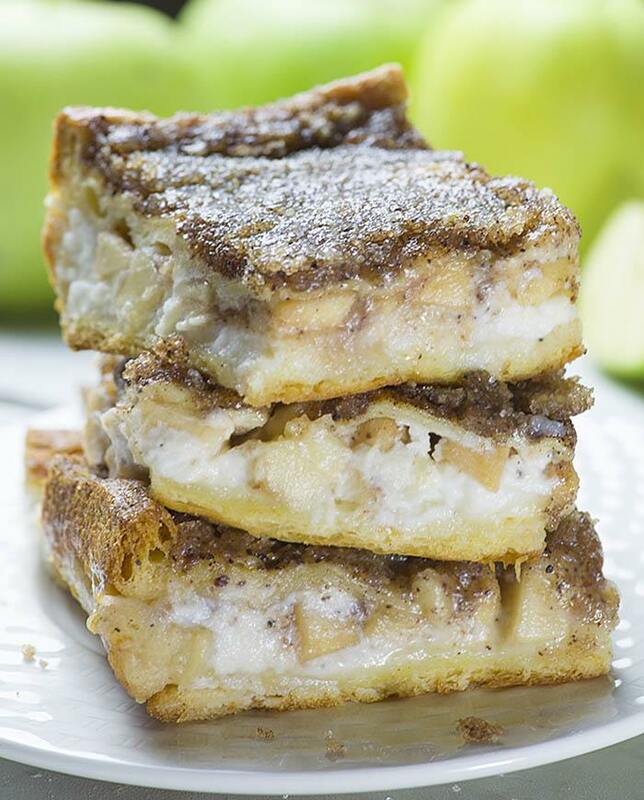 Actually, Easy Apple Cheesecake Bars taste almost like Cheesecake Sopapilla Bars but upgraded with apple pie filling. WOW, my moth waters right now, I wish I saved a few of these yummy bars for later. In fact, when I think about all my favorite treats, they all start with 2 ingredients: cream cheese and crescent rolls. Moreover I love this type of baked goods because they are very satisfying as a dessert, but you can eat leftovers for breakfast. It’s a win-win situation. I carried away lately(and to tell the truth, became a bit lazy)therefore many of my latest recipes starts with refrigerated crescent rolls (Southwest Crescent Casserole, Cheesy Chicken Crescent Dinner Rolls, Pumpkin Pie Bombs ) or refrigerated cinnamon rolls ( Pumpkin Pie Cinnamon Roll Casserole, Caramel Apple Cinnamon Roll Lasagna and refrigerated pie crusts (Peach Pie Cookies and Crumble Mini Peach Pie ). But these are all very delicious recipes, and you liked them, too. After all let’s be honest, who doesn’t like simple, quick and easy recipes that makes really delicious food, whether it comes to breakfast, dinner or dessert. Easy Apple Cheesecake Bars are delicious fall dessert with crescent rolls, cream cheese, fresh apples and buttery cinnamon sugar topping. Save leftovers for breakfast! Preheat the oven to 375F. Grease 8 x 8 inch baking dish with non-stick spray, set aside. 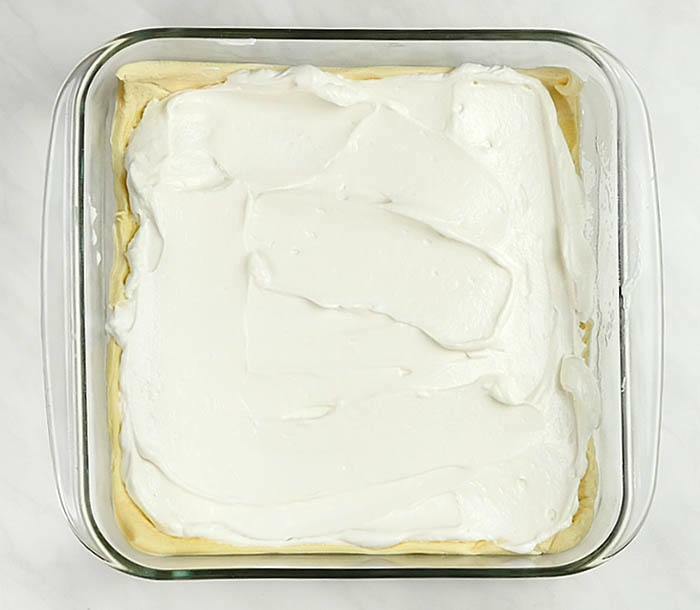 To make the cheesecake filling beat together cream cheese, ½ cup sugar and vanilla extract until smooth and creamy, set aside. To make apple pie filling stir together diced apples, ¼ cup sugar, cinnamon, nutmeg and cornstarch, until evenly coated, set aside. Unroll crescent rolls and cut in two halves. Place 1 half of dough (4 crescents) at the bottom of baking dish. Pinch together the perforation and stretch the dough to make the bottom crust. 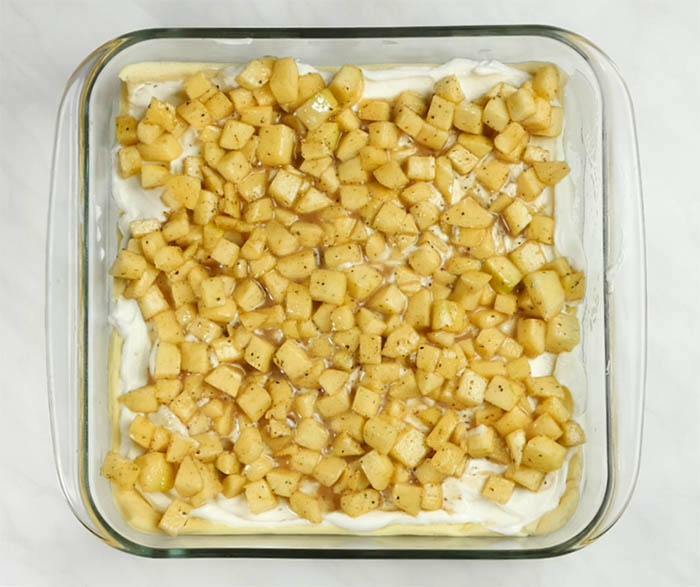 scatter diced apples over cheesecake filling. 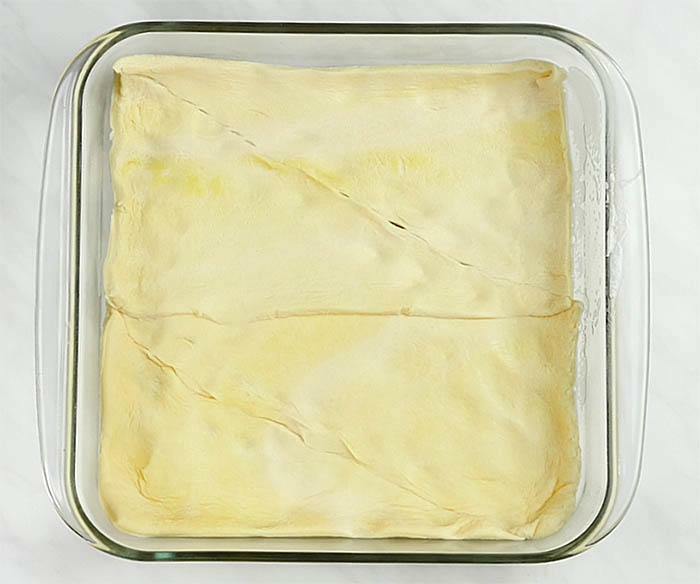 On a sheet of baking paper spread remaining dough, seal the perforation and stretch to create the top crust. Invert the crust over apples. Pour melted butter and spread on top of the crust. Sprinkle with cinnamon sugar. Bake for about 35 minutes. Tent the top with aluminum foil if it starts to brown too quickly. May I make a recommendation? Drizzle some honey on top right after baking, Sopapilas are basically honey, cinnamon sugar, butter and dough. Trust me, people will be stabbing each other to get them! I am going to try out the apples, that’s genius! HI Julie, thanks for the idea 🙂 Sound great!